In the great “Print vs. eBook” debate, I come down absolutely, positively, without a doubt, one hundred percent on the Print side. There’s just nothing quite like the look, feel, and smell of a real, printed book in my hands. I’m constantly running out of shelf space in my house, and lugging around a book everywhere I go isn’t the most convenient thing in the world, but I would never give up my library for an eReader. Alright, I’m calm now. I promise. So many books I’ve come across, and I’ll never read them, because they’re not available in print. Then I come to the point in the writing process when I have to start running through final edits and format the text to get it ready for print. As the not-so-tech-savvy person that I am, it’s a trial and a half, let me tell you. I go through the process of formatting the text so that the final printed book will look like a nice, neat, professional product, and all the while I’m grumbling and tearing my hair out and shouting at my computer when it doesn’t seem to do what I want it to do, and start to wonder why in the world I even bother to go through the effort at all! Yeah, I know. Open mouth, insert foot. Alright, authors, I apologize. It is frustrating, tedious, and time-consuming to format for print. 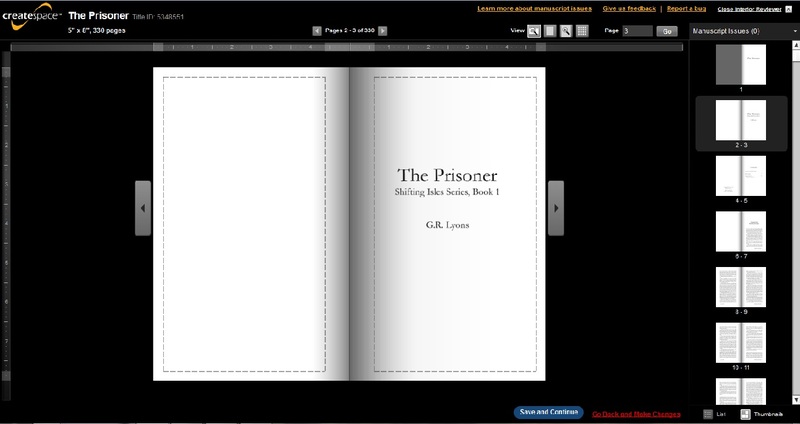 Setting up a file for an eReader is so much quicker and easier, I can see how it would be hard to justify the extra time to create a neat, print-worthy product. Then, there are moments, like today, when I finally get the finished text uploaded for print review. And, I mean, come on, look at this! How amazingly cool is this?! Isn’t this exciting?! To see something that you wrote, laid out on a screen, looking almost like a real book, showing you a preview of the glorious thing to come! Let me tell you, I am giddy as a kid in a candy store right now, knowing that in a few weeks I’ll have a real book in my hands, once again, with my name on it. Something that I pulled from my imagination and brought into the real world. It’s the most incredible feeling. But, gods, it’ll be worth every minute.